Summer, being the hottest season of the year, can be especially challenging for your car. Especially so for your tires. When temperatures push the century mark, road temperatures are much hotter, leading to an increase in tire blow outs. While you cannot control the weather you can certainly help keep your tires in top shape. Here’s what you need to know about your tires and summer driving. Hot weather builds up pressure within your tires, making them more prone to failure. Tires that are in poor condition to begin with are more likely to fail. Road temperatures can rise above 150 degrees on the hottest days, adding stress to your tires as never before. Tire inflation — You can decrease the likelihood of tire failure by keeping all four of your tires properly inflated. This means following the tire pressure recommendations of the car manufacturer by keeping your tires inflated to PSI levels listed in the owner’s manual or on the placard located on the driver door jamb. Check your tires when they are cold or have been driven less than a mile. Frequent checks are necessary — Year round, check your tires at least once per month. In the summer, keep an eye on your tires especially as temperatures begin to climb. If you are planning a major trip, ensure that your tires are ready to go. Check your spare too. If you see signs of excessive wear and tire, such as bulging and blistering or tread wear, then replace the affected tires. Tire replacement time — Never replace just one bad tire. When you are ready to shop, look for two or four tires. New tires should always be placed on the rear axle. If your spare tire is in poor condition, replace that one too. Tires on all four wheels should be alike. Emergency services — Before hitting the road, you should ensure that your auto club membership or other emergency service is up to date. Even with your best efforts, your car may still run into trouble. For example, you might hit a pothole or run over road debris, and lose a tire. Two or more damaged tires and your one spare won’t be sufficient. Keep your emergency numbers handy while on the road. When shopping for new tires, you can buy the same type of tire already on your car or use something different. You should know that changing the tire type may affect handling and fuel economy. There are a number of different retailers that can handle your tire needs. Dealer shops, tire stores, department stores, and warehouse clubs all sell tires. Work with a retailer that provides a broad selection of tires for your needs. You should know that typically tire manufacturers will offer discounts based on four tire purchases, offering a price reduction across the board or one tire free with your purchase. You should add in the cost of tire disposal, taxes, and fees when comparing tire prices from retailer to retailer. How long should your tires last anyway? That’s hard to say — every driver is different as are the road conditions they face. Tire quality is a huge factor too, with some tires rated to last from 40,000 miles to as much as 90,000 miles. 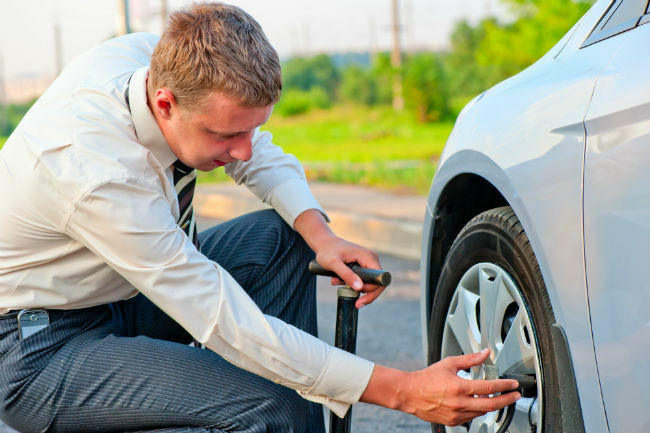 Yet, even those numbers are not always helpful as your tires can wear out faster if they are not rotated on a regular basis and kept properly inflated. Speaking about rotation, your owner’s manual offers the best guidance on how often to perform this feat. Typically, drivers should rotate their tires once every 5,000 to 7,000 miles or twice per year. Rotating tires ensures more even wear and can help you extend the life of your tires.